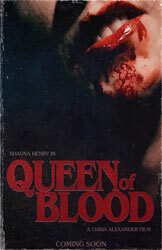 Autonomy Pictures is moving forward with the next Chris Alexander directing vehicle, Queen of Blood. The film is a follow-up to the DVD/Blu-ray release Blood for Irina. The new film will further deconstruct the vampire myth created in “Irina” and is currently in pre-production and will be released in Spring 2014. Queen of Blood follows the rebirth of Irina (once more portrayed by Shauna Henry), who rises from the center of the Earth, ready to bring a wave of death and madness to the battered wastelands of the Wild West. A parasite who roams the alternately breathtaking and dangerous rural landscape, Irina leaves of path of bloody destruction and victims as she aims her sights on a young widow whose unborn child may hold the secret to Irinas longevity. The film will also star horror art/music pioneer and Skinny Puppy frontman Nivek Ogre with additional cast members announced soon.